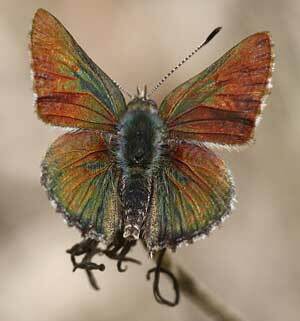 When we watch a spectacular butterfly flutter past we admire their beauty. But there is so much more to butterflies than meets the eye. Watching a butterfly fly past, it's easy to forget there is actually a complicated story behind this moment: before every delicate butterfly emerges there was a heavy-eating caterpillar or larvae. Some larvae can be extremely particular about what plant they eat and the conditions they require for survival. 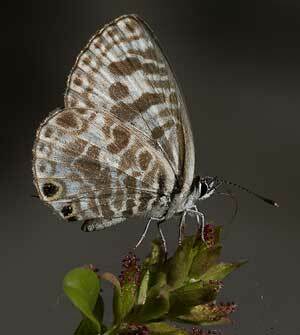 The Bathurst Copperwing butterfly (Paralucia spinifera) is an endangered species feeding only on a particular subspecies of the native blackthorn shrub (Bursaria spinosa subsp. lasiophylla) in the western Blue Mountains. 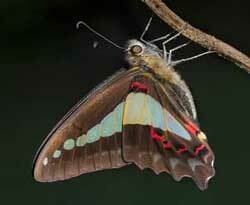 The butterfly occurs above elevations of 900 metres and has a mutualistic relationship with a species of ant, Anonychomyrma itinerans, which tend the caterpillars and even herd them into the ant nest for protection each night. These are not the only species to have a mutualistic relationship with a species of ant. Both species of hairstreak butterflies in the mountains, the Silky Hairstreak (Pseudalmenus chlorinda chloris) and the Imperial Hairstreak (Jalmenus evagoras) only occur where there are suitable Acacia species for the larvae to feed on and the appropriate ant species for protection. While butterfly larvae and pupae secrete food for the worker ants, the ants in return protect the larvae from outside threats such as parasites and predators. In 2015 I noticed populations of the Imperial Hairstreak appearing in new areas after the 2013 fires to breed in the Acacia regrowth. 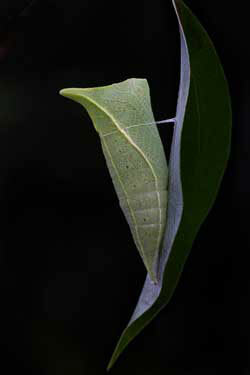 Some caterpillars make use of exotic plants. The larvae of the Orchard Swallowtail butterfly (Papilio Aegeus) now happily feed on citrus trees and the larvae of the Blue Triangle butterfly (Graphium sarpedon) feed on Camphor Laurel. See their lifecycle below. I wonder how the transition from native to introduced food plants happened and how their range has changed with the spread of garden plants? 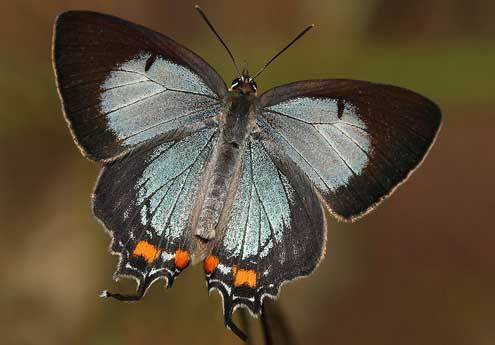 Resident butterflies vary in the way they survive the colder months. Late forming pupae of the Swallowtails (Papilionidae) suspend their development (diapause) and emerge when conditions are more favourable. They then go on to lay eggs for the next generation. 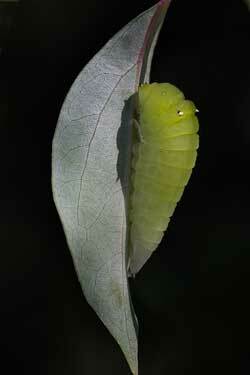 By contrast the Imperial Hairstreak lay eggs which overwinter and the larvae emerge later in the year. We also get migrant butterflies depending on conditions outside the Mountains, such as the Caper Whites which passed through the Mountains on their migration for about 2 weeks in 2015. 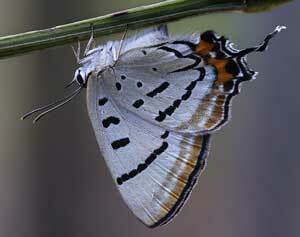 The diversity of butterfly species varies with each month the majority occurring in the warmer months. Plumbago shrubs in our gardens come alive when the Plumbago Blue (Leptotes plinius) emerge each Autumn. 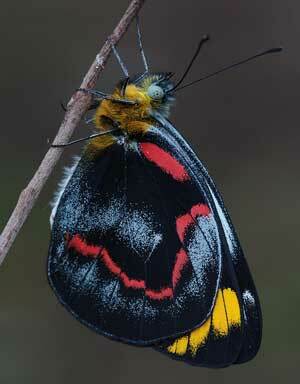 We also see the Black or Common Jezebel (Delias nigrina) around Springwood in the cooler months. The diversity also changes each year depending on conditions here and elsewhere in the case of migrating species. As with other wildlife the more you look the more you see. So keep an eye out for your local butterflies and give them a second thought – there is more than meets the eye!